What is an Error Bar? An error bar is a line through a point on a graph, parallel to one of the axes, which represents the uncertainty or variation of the corresponding coordinate of the point. In IB Biology, the error bars most often represent the standard deviation of a data set. Click here to learn what the standard deviation is or here to learn how to add standard deviation error bars to a graph in Excel 2016. Why Include Error Bars on a Graph? How spread the data are around the mean value (small SD bar = low spread, data are clumped around the mean; larger SD bar = larger spread, data are more variable from the mean). The reliability of the mean value as a representative number for the data set. In other words, how accurately the mean value represents the data (small SD bar = more reliable, larger SD bar = less reliable). It's important to note that just because you have a larger SD, it does not indicate your data is not valid. Biological measurements are notoriously variable. 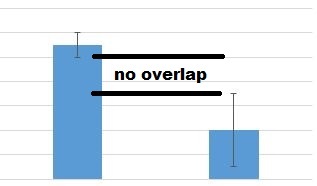 What do Error Bars Indicate about Statistical Significance? A "significant difference" means that the results that are seen are most likely not due to chance or sampling error. In any experiment or observation that involves sampling from a population, there is always the possibility that an observed effect would have occurred due to sampling error alone. But if result is "significant," then the investigator may conclude that the observed effect actually reflects the characteristics of the population rather than just sampling error or chance. 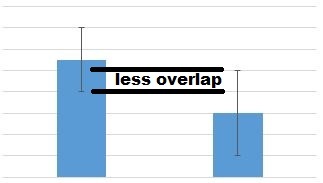 When standard deviation errors bars overlap quite a bit, it's a clue that the difference is not statistically significant. You must actually perform a statistical test to draw a conclusion. When standard deviation errors bars overlap even less, it's a clue that the difference is probably not statistically significant. ​You must actually perform a statistical test to draw a conclusion. 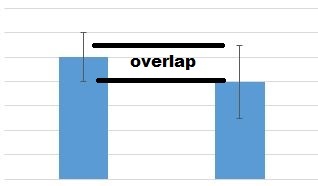 When standard deviation error bars do not overlap, it's a clue that the difference may be significant, but you cannot be sure. You must actually perform a statistical test to draw a conclusion. The standard deviation is NOT a statistical test, rather the standard deviation is a measure of variability. To assess statistical significance, the sample size must also be taken into account. Therefore, while standard deviation error bars can give you a clue about statistical significance, you must actually perform a statistical test to draw a valid conclusion. For more, you can read the article "Error bars in experimental biology."